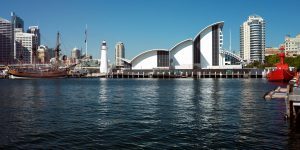 All attempts by the Australian National Maritime Museum to keep seagulls from leaving droppings on the exhibitions, piers and historic vessels had failed, until research led them towards the idea of using a dog to deter the birds. Bailly was recruited from a rescue home, given the prestigious title of Assistant Director of Seagulls and sent to work. His ability to scare away the birds has seen a significant reduction in the number of birds inhabiting the area surrounding the museum. We ventured out to meet Bailey and see him in action. Bailey lives in the security control room when he’s not on duty, and has significantly improved morale among staff who line up to walk and help care for him. You can keep up to date with Baileys adventures via his blog or via his facebook page.